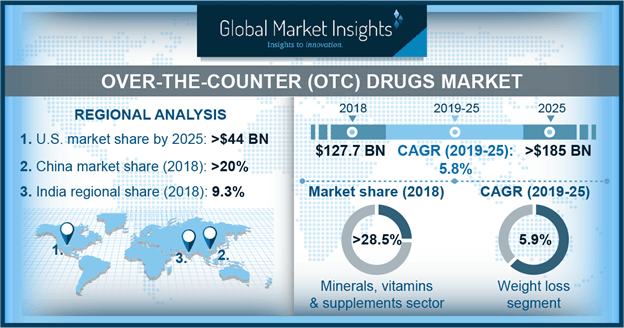 Over-the-Counter Drugs Market size is set to exceed USD 185 billion by 2025; according to a new research report by Global Market Insights. Pharmaceutical companies’ switch from Rx to OTC drugs serves as high impact rendering factor on industry growth over the forecast period. This will provide potential growth opportunities for companies to rejuvenate an off-patent brand into a new life-cycle growth phase.